The Toyota Triple Challenge is happening again this year, alongside select Supercross events. Starting at Anaheim Stadium. Fox riders, Pat Casey, Scotty Cranmer and Drew Bezanson will all be in attendance. Best of luck to everyone competing! 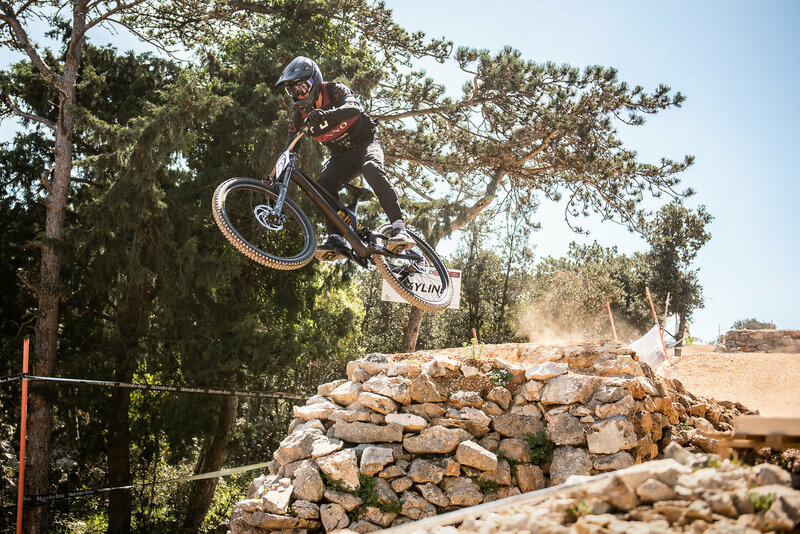 Imagine a port-side DH race with a view of the Mediterranean most of the way down. Imagine you can finish your run and jump straight into the sea. 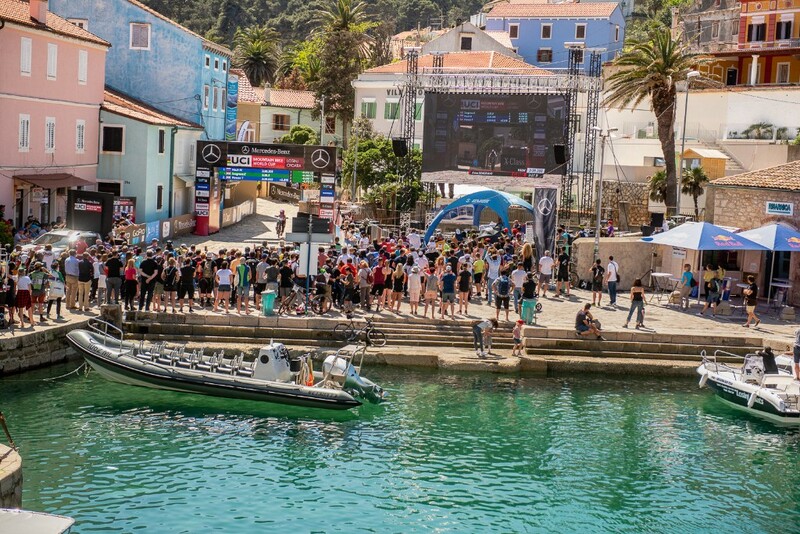 This is what the riders enjoyed all day long in Lošinj, Croatia, for the first round of the DH World Cup 2018. The beautiful atmosphere was the nicest part though: the track was short, super rocky and any mistake could cost you big time. 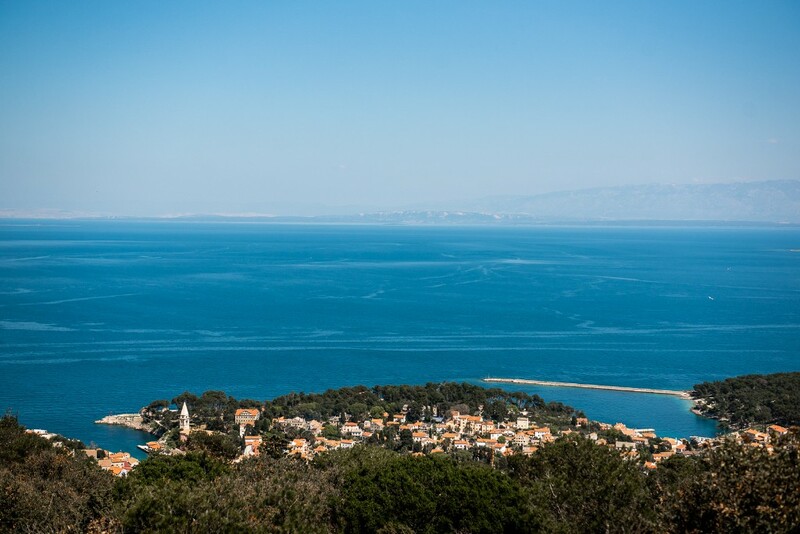 Read on for the different Croatian experiences our riders had this weekend! “It's the first race of the season but I was pretty relaxed at the top which was cool. As you can hear in the background, it's such a good race with a big crowd! I'm just happy to start my season like this, I'm going to build from here and I'm looking forward to Fort William because all my friends and family live very close so it's very special for me”. 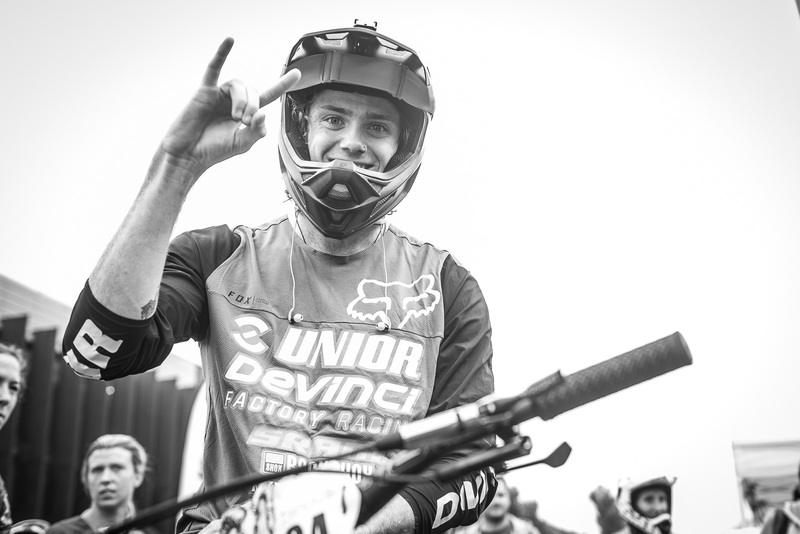 It's clearly obvious that even if not all the riders had their best weekend ever, they're all super hungry and motivated for the next round in Fort William. Fox Racing and the US Open of Mountain Biking have agreed to a multi-year partnership between the two iconic brands. The newly branded Fox US Open of Mountain Biking will take place at Killington Resort August 1st-5th, 2018. Following their support of the successful 2017 US Open relaunch, Fox Racing has increased their involvement with joint marketing and production efforts around the US Open brand. “The US Open holds a special place in the history of North American mountain bike racing. Fox was excited to support the return of this great event in 2017 and we are proud to increase our involvement to title sponsor this year. Our goal is to help position the Fox US Open of Mountain Biking as the leading gravity event in the U.S. in 2018 and beyond.” – Dave Ahumada, Global Marketing Manager, Fox MTB. The Fox US Open of Mountain biking will feature a wide range of events including the legendary Open Class Downhill, the inaugural USO Enduro, best whip comp and the Grom Bomb and Super Grom Downhill events, giving the future of the sport a chance to show what they’ve got. “Just like us, Fox believes in the heritage of US gravity racing, and we’re thrilled to sign this multi-year partnership with them. Their unwavering commitment to the sport and reputation in the industry is second to none. We’re looking forward to developing the next chapter of the US Open with Fox. Racers and fans can expect great things!” – Clay Harper, US Open Event Director. Killington Resort has made huge investments over the past 4 years to become a mountain biking destination. 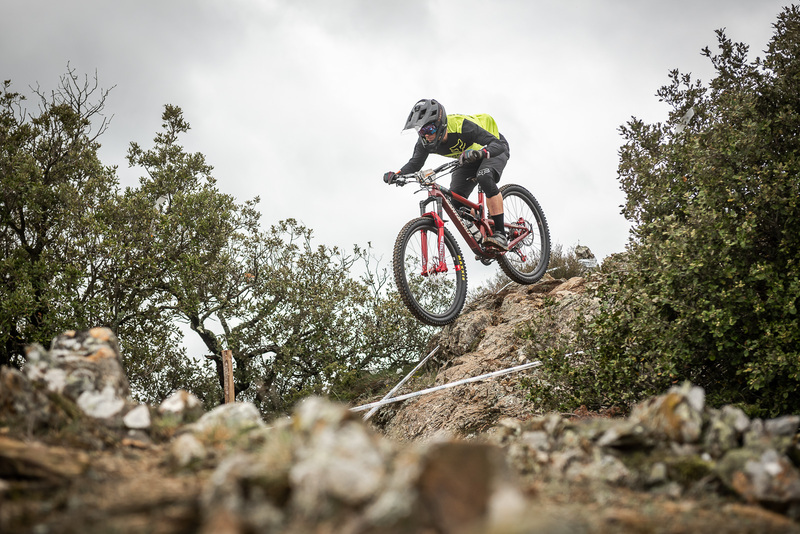 A new downhill track, onsite campground and extensive lodging options and restaurants make it the perfect venue for an event like the Fox US Open of Mountain Biking. Fox joins an excellent list of additional US Open partners including GT Bicycles as the presenting partner for downhill and enduro events, Red Bull as the presenting partner for the USO Best Whip Comp and Vermont Adaptive Ski & Sports as presenting partner for the adaptive downhill. CLIF Bar, Flat Tire Defender and Fox Factory are also onboard with plans to activate around the 2018 Open. More event information and registration details coming soon. In the cold climates of Canadian Winters, Indoor riding facilities have been becoming the only way to escape the weather and keep wheels in motion.Calgary’s newly established B-Line Indoor Bike Park will be a savoir to many as the temperatures drop. In only its first few months of opening, B-Line has been building awareness, increases its traffic and growing the bike community bigger every week. With over 60,000 sq/f of warehouse space, the B-Line crew built a world class riding facility catering to riders of all skill levels. From beginner loops, intermediate pump-tracks, expert jump lines and a foam pit, B-Line has something for everyone to ride and improve their bike skills. On Wednesday January 10th, Fox MTB athlete Anthony Messere and Fox BMX athlete Drew Bezanson visited the park for a Fox Ride Night and spent the evening giving locals encouragement and giving away plenty of prizes. It’s always special when a busy athlete makes time to visit a local riding hub and over 200 people came out for the Fox Ride Night to meet Drew & Anthony - all of them left with signed posters and big smiles! Ride into the New Year with Fox Racing and B-Line Indoor Bike park! Join us for an evening of riding*, free Fox product giveaways and good times with special guests Drew Bezanson & Anthony Messere. B-Line will be offering free bike rentals while supplies last throughout the evening and Fox Racing will be giving away free prizes all night so there’s no reason not to come crank it up with your friends! With dedicated riding areas for beginners, intermediates and experts, there’s terrain for everyone to have a good time on two-wheels - There’s even a foam pit if you’re feeling daring enough to go upside down for some extra thrills! Following the evening of riding, Drew and Anthony will be on-hand giving away free posters and signing autographs so that you leave with a personalized memory. For Directions and more information about B-Line Indoor Bike Park policies, visit their website www.blinebikepark.com. Want a fleece that does more? Check out FOX Utiliterry Fleece which is 4x stronger than regular fleece, features a durable water resistant coating and blocks out twice as much wind as any standard fleece. 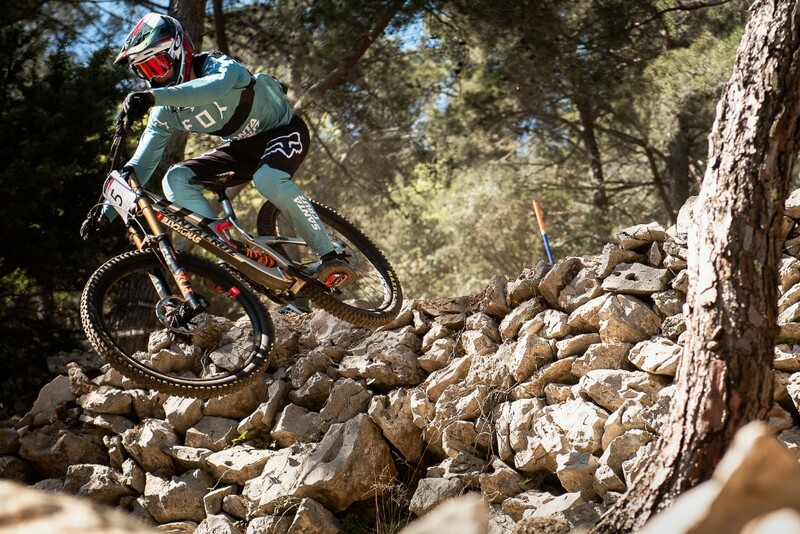 Loïc Bruni is the new MTB World Champion! Welcome to Cairns! This Australian track is unlike any other so far this year year: very, very fast, super loose, and due to the dry weather, more dusty than ever with some tough pedaling sections which made it extremely physical too! Just over a year ago, Loïc Bruni won his first ever World Cup on this track, so he was well aware of what could be possible here. The local crowd were cheering for hometown hero Mick Hannah, who stayed on the hot seat for much of the day, and looked as if he had possibly done enough to take the title. Unfortunately for the Aussies, Loïc became 'Super Bruni' again and laid down a superlative run to take the lead by only .039 of a second. Nobody was able to go faster, and the time stood, making Loic World Champion for his second time in his short career! Two days before finals, she was the fastest during timed training. Deciding to risk it all in pursuit of the title she pushed too hard in the unpredictable dusty conditions and crashed: “I pushed a bit too much today and crashed... This race was mental! I'm glad the other girls pushed so hard as well, we all wanted the title so much. I don't mean it's nice to see everybody going down, but the fact we were all so competitive was awesome!”. It was a great year for the Fox 2017 Gravity team. 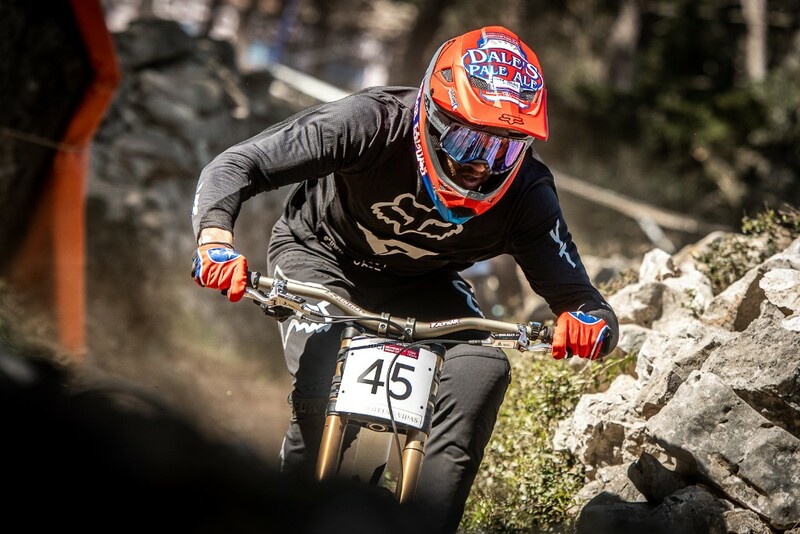 The 2017 DH season is now over and 2018 will start on the 21st - 22nd of April in Lošinj, Croatia for another intense year! 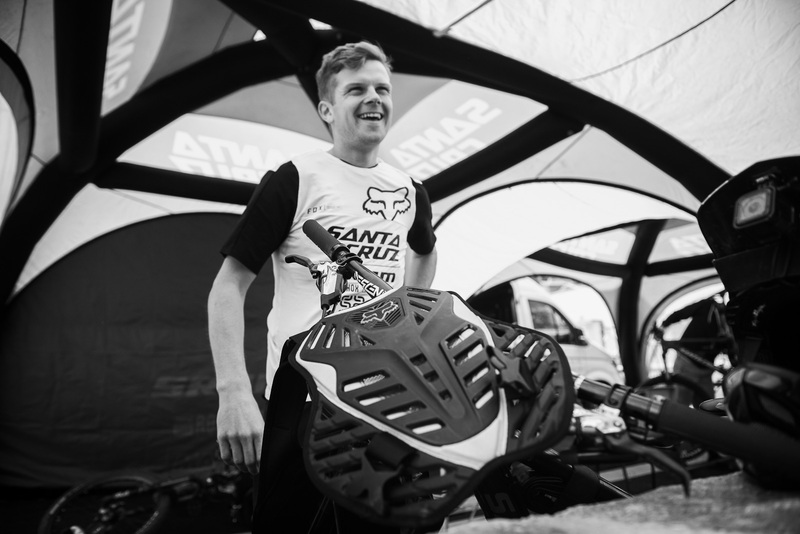 *All of the Fox DH team riders wear the proven Rampage Pro Carbon helmet and Flexair gear. Red Bull District Ride is the fourth and final FMB Diamond event of the season and everyone's last chance at valuable World Tour Title points. After a three-year hiatus, the most unique urban slope style event returned to the streets of Nuremberg. A town rich with history is transformed into freestyle "districts" that are scored individually and then combined to give the rider a final placing. Fox MTB team athletes competing were 2014's runner up, Brett Rheeder and fellow Canadian Anthony Messere. Rheeder would go down hard attempting a cork 720 and opted to sit out Finals while Messere put down two clean runs but was only able to score a 6th place result. Some days, everything goes to plan and Saturday in Val di Sole was certainly one of those days! At the last round of the year, Tahnee Seagrave and Finn Iles both won yet another World Cup race! Loïc Bruni and Loris Vergier both ended up on the Elite race podium and took spots on the overall podium as well! She was right up there with a second place in qualifying, and stepped up to take the win in finals: “I've never done well here so for me it was a big improvement! I wanted to do better than last year here which was 5th! I think I really wanted another win because even though I couldn't beat Myriam Nicole in the overall, I could take more race wins than her this season and I wanted to prove something! To win here was definitely in the back of my head but I tried not to think too much about it! Now, I'll start to focus on World Champs”. Now the riders have a few days off before flying to Cairns (Australia) for the World Championships! They are all well and truly in the hunt for medals, hopefully some great news in a few weeks time! *All the FOX DH World Cup athletes wore the Fox Rampage Pro Carbon DH helmet and podium proven FLEXAIR jersey and pants. Cam McCaul heads north to British Columbia, Canada in search of the elusive Brett Rheeder. His expedition pays off with a ripping good time getting the latest scoop on the Crankworx champ, as well as some personal stories from Rheeder's mom. There are many ingredients to Finn Iles's recipe for success, but focus is undoubtably essential. Whether Iles's is thundering towards yet another World Cup win on the UCI circuit or filming in the streets of Quebec at 5 a.m. – the call time for Red Bull Purest Line – his focus allows him to mute everything but his bike and the track when he's in the saddle. Red Bull Purest Line marks just another highlight of Iles's 2017 summer. From graduating high school to securing the World Cup overall title with two races left in the season, the future is an open book for him. Last weekend saw the 5th round of the UCI World Cup take place in Lenzerheide, Switzerland. What was once considered a ”bikepark" track has morphed into the most unpredictable course of the year. The new course was unforgiving of the smallest mistake and FOX team riders had a tricky weekend in the office with some ups and downs! This definitely adds some flavor to the season. Maybe the happiest guy in the paddock, taking another World Cup win and with it an unassailable lead in a race for the overall World Cup! “I had a very good run and I'm satisfied with my time too! I'm stoked for the overall as well because it means I can relax for the rest of the season. The next round will be at Mont Saint Anne in Canada, my home country, and I would love to take the win in front of the Canadian crowd. It's great to go there with almost no pressure”. “It's a shame to have messed up two of the five races so far! I was on a good run and I pushed a bit too hard. I finished five seconds from the winner and I know that in the past that could have been enough for a second place. It's cool that the women's level is getting higher, that's great for the sport”. "I am really happy to of managed to get on the podium in lenzerheide, 6th to 10th place finishes have happened quite a lot now and I for sure have my eyes set on the podium! It's an amazing feeling and almost a relief at the same time... just have to do it again in a few weeks in Canada". “I was pretty relaxed before my start, I had a good feeling, you know like a switch in your head which means you can do well. I started without pushing too hard but I made a small mistake in the first rock garden. I told myself to forget it and to start the race again. But I made two other mistakes in sections where it's critical to carry speed. All these mistakes cost me time and with the racing so tight right now, you can't afford to do that. Now I have the feeling I missed a good opportunity. I'm still top ten which is good, but what I really want is to be in the top three! I have to work harder!”. “I have to admit that my head was on holiday already and when I did a good quali on Friday, I felt I could do well here. I was confident for finals and maybe a bit too much. After my run, I stayed 10 minutes alone to think about my crash and I realised it's not a disaster. I'm young, I didn't get injured and it didn't happen because of a mechanical. Everything worked perfectly and it just my fault. What makes me happy is that I'm still 4th overall because of my performance in qualifying, but I want more podiums!”. “I looked at the points and I thought, if I can get down with a 50th or a 40thplace run, I could get some points which is always pretty good for the overall. So it's what the goal for the weekend was. I did only 5 runs during the 3 days and it was still very painful. My race run started pretty well but I crashed half way and I decided to cruise down to not take anymore risks. It's four weeks now to Mont Saint Anne so I'm going to get an X-Ray as soon as possible to assess the extent of the damage to get a better idea of what kind of shape my hand will be in for MSA”. The DH team now has a 4 week break before heading to the penultimate round of the World Cup series in Mont-Sainte-Anne, Canada. A few hundred kilometres away, the Enduro riders were having one of the hardest races any of them had ever experienced in their careers! Soaked by the rain for two days, the freezing temperatures and slippery mud made the stages even more gnarly than they were already! “I'm completely knackered, it was so so hard! The weather was such a nightmare and the race was super physical. The cold didn't help either! Most of the time you're racing for one day and I have to admit it wasn't easy to be motivated for the second day! I was 5th at the end of the first day, I had a little cold and I didn't expect to be on the podium at the end of the race! But somehow, I got more power in my legs on Sunday and my track speed was better as well. My last two stages helped bump me up the standings to 3rd place. It's my second podium of the year which means at least some good luck is back on my side!”. “I have to admit it was pretty hard to go and ride the second day in a freezing cold and wet weather! But it's the same for everybody and I had to push myself to find again a good speed. Unfortunately I didn't feel as good as I was the day before! The battle to be on the podium was super tight and I missed it by a few seconds. I'm a bit disappointed to finish 5th but it's my best result of the year and I'm now 9th in the overall which is pretty cool!”. The whole MTB industry spent the week in Les Gets for the 2nd stop of the Crankworx World Tour 2017. Luckily, this year the sun was beating down on Les Gets the entire week and all our riders enjoyed the opportunity to ride and compete in the awesome conditions! Brett laid down a solid first run, which was good enough to take the lead. Nobody managed to best his score with their second runs, so Brett got to cruise down for a victory lap! After wining Rotorua (2015), Les 2 Alpes (2015) and Whistler (2016), the Canadian won yet another Slopestye here in France and was pretty damn stoked: “I just came back after an injury so I feel really relieved to win today. It has been hard work to get back! We had some good practice sessions with all the guys, but it was tough here today with the wind. For sure before my first run I was a bit nervous, I didn't want to screw up, and then sitting up top watching all the guys doing their second runs was hard!" 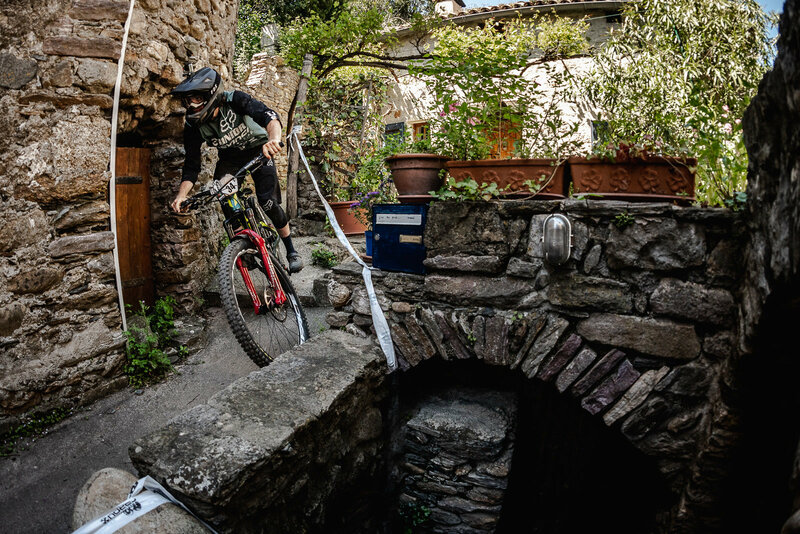 Air DH in Les Gets is a bit different to A-Line in Whistler, with roots, jumps and steep techy sections and ex World Cup Champion Josh Bryceland demonstrated he still has the speed to compete! Josh ended up in 3rd place and showed that when you have talent running through your veins, you don't have to take racing super seriously to get on the box every now and again! It was so rad to see the Rat back on a podium! TAHNEE SEAGRAVE TAKES HER FIRST ELITE WORLD CUP VICTORY! FINN ILES WON THE JUNIOR CATEGORY! Finn kicked off the day in some style by taking the win and solidifying his leadership of the overall : "I was a bit frustrated last weekend (he finished 2nd in Fort William, Scotland) and yesterday (2nd place in qualis), so I'm happy with my result and with my time too. It's was a good weekend! There is a good battle going with the other guys and I think it will be very interesting between us for the rest of the season." Podiuming on the previous two visits to Leogang, Connor was clear he wanted to do the same again this year. He finished 10th but was still happy to have a solid result: “It's still a good place, I couldn't have gone any faster. The times were super tight! The guys at the top went so fast! I'm happy to be in the top 10 and I'm already looking forward to the other races." Unfortunately we have to finish with some bad news. Loïc Bruni crashed during Saturday's practice and had to go to hospital to deal with an extremely severe inflammation. Loic posted on his social media: “I thought it was a random punch in the leg. After the qualis I could not walk any more, I had ruptured vein on the inside that was leaking blood into my leg”. Loic will be spending a few more days in Leogang to wait for the swelling to go down, and hopefull he'll be back soon. All the best to you champion! Dream about waking up with epic mountain ranges that have more trails systems than you can conquer in a summer? Like many Squamish residents, Thirteen-year-old Jackson Goldstone gets to wake up and ride into that dream playground everyday! Squamish is a municipality of British Columbia with a population of over 15,000 people and the roots of the mountainbike culture & lifestyle run deep at early ages. The Goldstones have resided in Squamish for over 20 years and Jackson was actually born at the Regional Hospital only meters away from where they still live. Perched above the Sea-to-Sky Highway and only a handful of minutes away from town, Jackson was able to rde his bike to school every day (*that he attended) for a three year streak! Forestry is the towns largest industry creating endless amounts access roads leading to clear cut sections and trailheads with incredible views and terrain the whole way down. Aside from the endless natural terrain Squamish has to offer, the roots of the "North Shore" trail features live on... and sometimes you just need to send it! 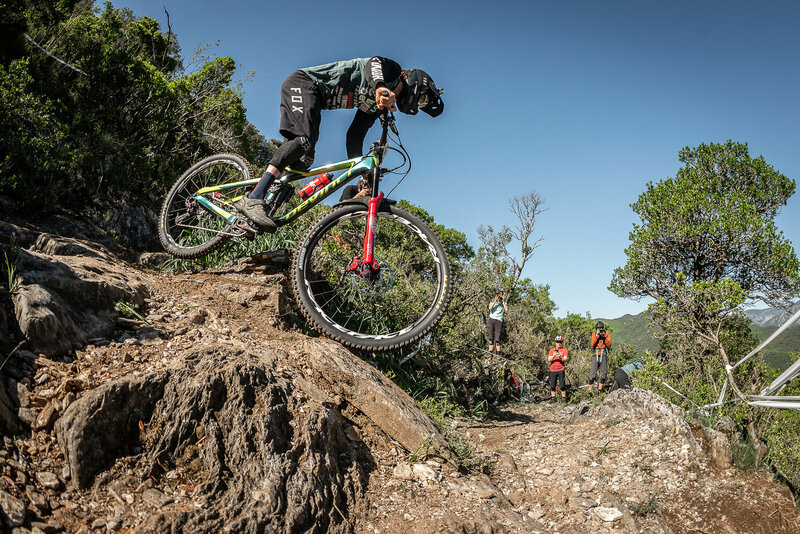 Nine intense stages over two long days of racing, the third round of the Enduro World Series in Madeira was extremely tough! Lots of riders suffered from mechanicals and crashes, including Fox Racing guys, Damien Oton, Théo Galy, Mark Scott and Iago Garay. Luckily they all made it through unscathed, read this little bit of insight into how their races went! Congrats guys, we're proud of you all! The 2017 Downhill Mountain Bike World Cup season has arrived! 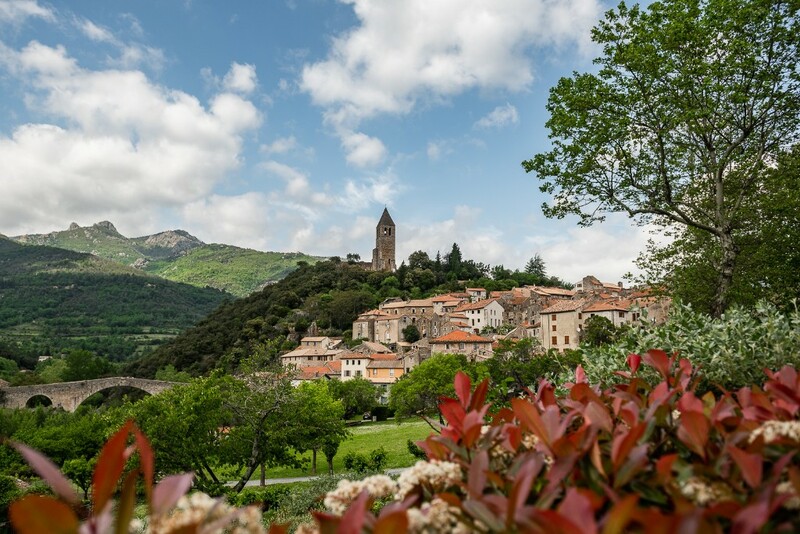 This weekend the most exciting style of bicycle racing action you will ever see gets underway from beautiful Lourdes, France at the foothills of the majestic Pyrenees Mountain range. 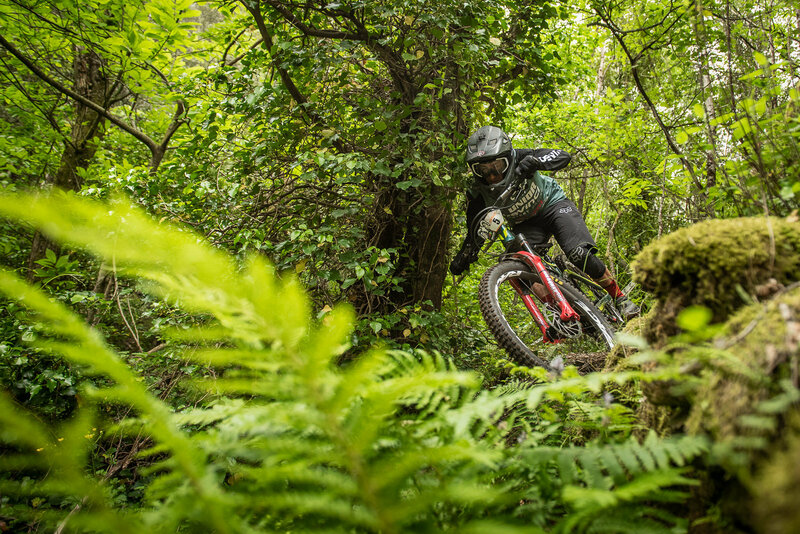 The track at Lourdes is known for brutal rock sections, tricky woods sections with some big jumps and the legendary steep wall section at the top. This year may see the added excitement of a wet and slippery course as it snowed on the trails earlier today. The latest reports show skies clearing and the track drying so if the weather holds it should be a fast and rough race – either way it should be an amazing start to the 2017 season…one you surely won’t want to miss! 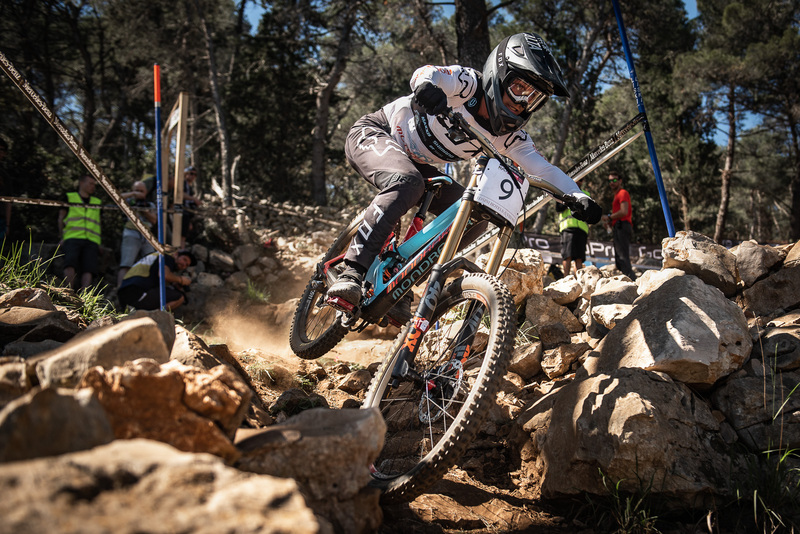 This year the Fox Downhill MTB team is loaded with an amazing mix of young talent including 2015 World Champ Loic Bruni; Long time Fox team riders Connor Fearon and Tahnee Seagrave and young guns Loris Vergier, Magnus Manson, Josh Button and Laurie Greenland. The Junior team is led by current Junior World Champion Finn Iles and includes up and coming riders Anthony Poulson, Joe Parfitt, Kaos Seagrave and the always fast Tegan Molloy! The racing begins at 4:00 am Pacific Daylight Time this Sunday. 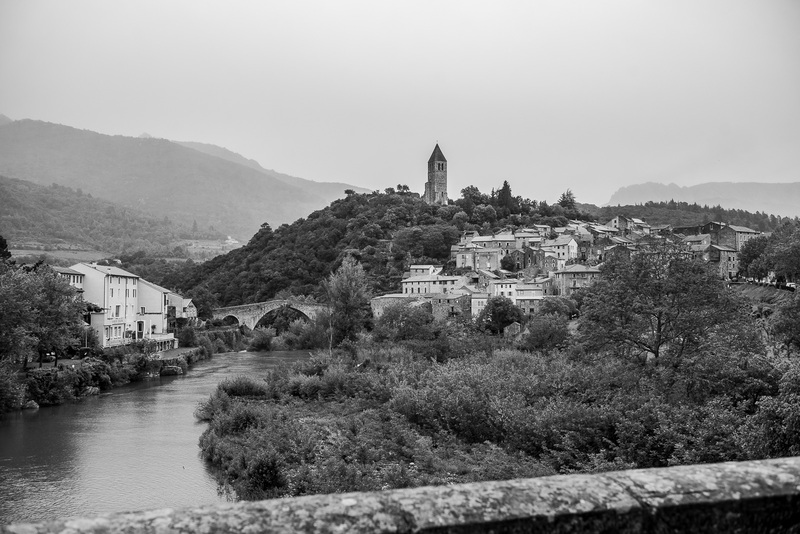 Lourdes is the first of 7 stops leading in to the World championships in Cairns, Australia in September. We’ll keep you posted on all the happenings throughout the season. FOUR PODIUMS AT THE FIRST UCI DH WORLD CUP IN LOURDES! FINN ILES TOOK THE WIN AND KAOS SEAGRAVE FINISHED 2ND IN JUNIOR MEN CATEGORY. "I knew I could go faster for my final run because I lost a few seconds during the qualis at the bottom of the track (he was 3rd). Because of that, I started a little too fast and I almost crashed in the first corner! That scared me a bit, so I tried to be more focused and do a solid run. I’m very happy to take my first win in the rainbow jersey!" Explained Finn. Kaos has plenty of reason to be happy as well, climbing up onto the box for the first time! Already second during the qualis, he maintained his position and now can’t wait to try and go one better at the next few rounds. 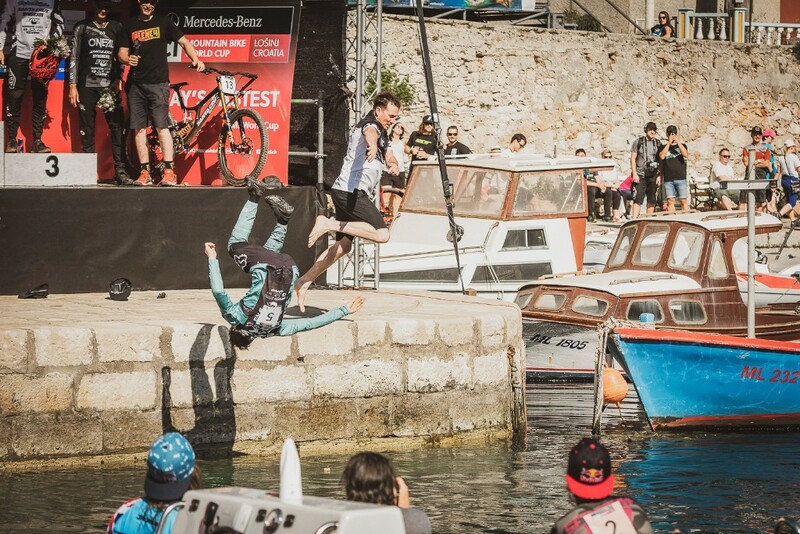 LORIS VERGIER AND LOÏC BRUNI WENT TO HELL AND BACK! After the qualis, Loris was fastest with Loïc just behind in second. But towards the end of race day, a storm came in and ruined the chances of the top 15 qualifiers. Loïc and Loris had absolutely no chance to compete with the best times of the day. “Honestly, before my run, my only goal was to stay on my bike. I tried to ride properly but it was way too insane! Either way it was fun, I’m in one piece and I have to be happy about that” said Loris. “I tried to do a fast run to save some points for the overall but I quickly figured out that that was impossible! The track was way too dangerous and slippery. To be honest, I was scared, it was pretty gnarly” added Loïc. The next round takes place in Fort William, Scotland, on the 4th of June! Fox Racing is proud to announce the 2017 Fox MTB Global Downhill Race Team. The new season brings a fresh mix of long time Fox riders ready to take the next step on the global stage combined with exciting new additions who bring both youth and experience to the team. 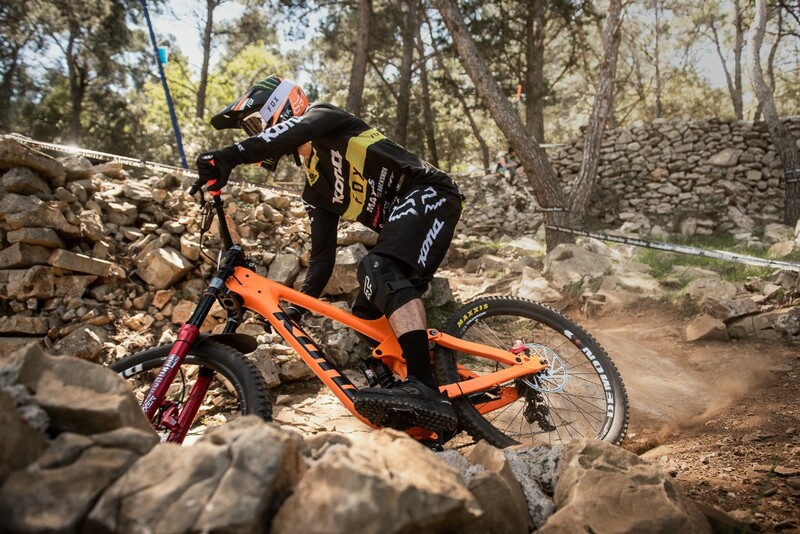 The Fox DH team brings together riders from around the globe to compete in the 7 stops of the UCI Downhill Mountain Bike World Cup series and the World Championships on the legendary track at Cairns, Australia. Loic Bruni (Specialized Gravity), Tahnee Seagrave (Transition/FMD), Connor Fearon (Team Kona), Loris Vergier (Santa Cruz Syndicate), Magnus Manson (Team Kona), Finn Iles (Specialized Gravity), Josh Button (Team Kona) Anthony Paulson (Team Kona), Joe Parfitt (Transition/FMD), Kaos Seagrave (Transition/FMD) Tegan Molloy (Team Kona) and Laurie Greenland (Mondraker). “For 2017 our mix of riders is one of the most competitive teams we have ever fielded. Mike Redding (Global sports marketing manager) and Vincent Saccomani (Fox Europe sports marketing manager) have done an amazing job of putting together a group of athletes who are not only top level riders, but are also great ambassadors for the brand and for the sport of Mountain Biking. At an average age of 23 years old, we look forward to supporting these athletes and their teams now and in the future.” – Dave Ahumada, Global Marketing Manager – FOX MTB. 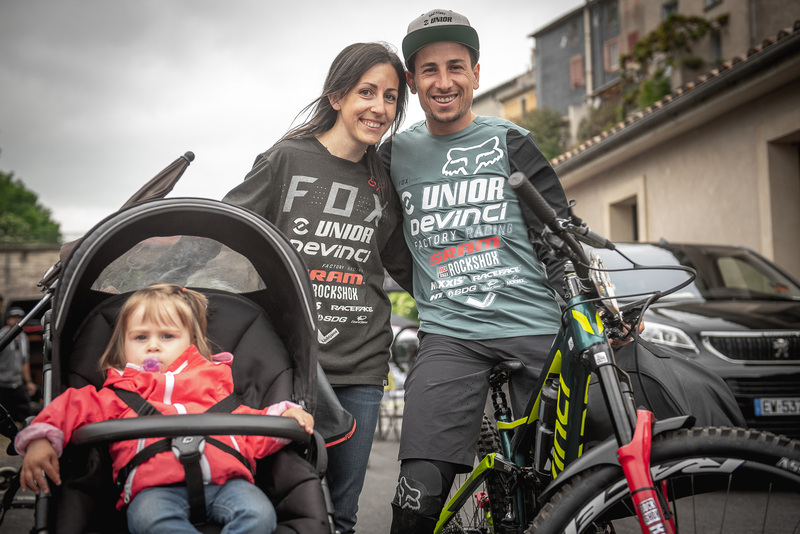 Beginning this weekend (April 29-30) in Lourdes, France the team will be running the Pro Level Fox DH Race Kit including the proven Rampage Pro Carbon helmet; Flexair jersey, pant and glove and the all new Launch Pro D30 guards as they compete throughout the grueling 7 stop series. Fox changed things up this year at The Sea Otter Classic in Monterey, CA. In the past, we set up in the tech expo row, but decided going with that grass roots feel sounded like it would be a good time. We drove the rig up and set up on the campgrounds above the raceway. Our main initiative was to open up our home to surrounding campers and host a viewing of our latest film, “Ride Your F#%king Bike!” We set up the BBQ, invited campers up to our site, chilled, grilled and watching the movie under the stars. We were stoked on the turnout of around 100 campers in attendance. Due to the World Cup and Fest Series going on the same weekend, we didn’t have as many athletes on site, but it was great having Mark Scott, Iago Garay, Bas Vansteenbergen, Kirt Voreis and Jackson Goldstone in attendance! Mark Scott Santa Cruz Bike’s finished 5th in the Pro men enduro, and qualified for dual and was eliminated in the early rounds. Iago Garay qualified for Dual Slalom and was knocked out mid rounds. Kirt Voreis raced the downhill and pretty much just had fun doing whips at the top for the fans. Bas Van Steenbergen raced the downhill and finished 6th. Overall, it was a great weekend and we’re excited for next year! Ride Your F#%king Bike - The Movie. Powered By Chainsaw. “Ride Your F#%king Bike – The Movie. Powered by Chainsaw.” Featuring Fox athletes Josh Bryceland, Josh Lewis, Kirt Voreis and other Fox teammates, the movie documents three weeks on the road with a wild crew up for anything. Filming kicked off at Fox Headquarters in Irvine, Calif., and continued north through Oregon and Washington before crossing the Canadian border and reaching Vancouver Island. The movie is dedicated to Stevie Smith, aka Chainsaw, a World Cup champion gravity athlete who unexpectedly passed away in May 2016.